Richard Larkin returned to Palm Tree Lagoon for a second days angling. After catching several predatory and Carp species on the previous day Richard decided to stalk one of the lake’s big Arapaima gigas. Richard used strong fluorocarbon hooklengths attached to super sharp Owner hooks with small koi livebaits mounted onto the hook. After gently casting the livebait out, Richard carefully released line allowing the stricken Koi Carp to work the central part of the lake. A large 2m Arapaima gigas suddenly surfaced in the immediate area of the bait before diving back down into the depths. The braided mainline was suddenly ripped from the anglers grasp as the massive Arapaima charged off with the bait. Richard battled the armoured predator for fifteen minutes as it embarked on a series of powerful runs in the central part of the lake. The massive Arapaima began to tire and was slowly brought towards the waiting net. On sight of the waiting landing net the monster Arapaima angrily thrashed in the margins in an attempt to evade capture. After a few more seconds of absoloute bedlam the Arapaima aggressively shook its head shedding the hook in the process! The bony nature of the Arapaima’s mouth coupled with the violent lunges from the Amazonian predator had resulted in the hook not taking a firm hold in the fish’s mouth. A conservative estimate of 150kg’s was placed on the lost fish leaving the anglers to contemplate just how close they had come to landing the monster fish. After regaining their composure the anglers continued to stalk large Arapaima which regularily showed at various parts of the lake. After a few more aborted takes on the livebait another rod fished on the bottom with a deadbait burst into life! A short five minute battle followed resulting in a Sharptooth Catfish being brought to the net of some 15lbs. 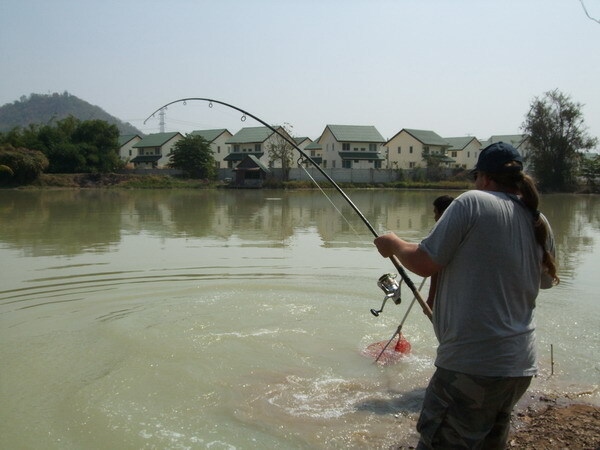 Richard continued to stalk Arapaima into the evening regularily casting at showing fish at various areas of the lake. No further takes came on the livebaits possibly due to the loss of the monster fish earlier in the afternoon.